Baseline is a genuine low birth, calving ease bull that you can breed to heifers with comfort. His first calves have averaged less than 75 lbs. thus far and have great vigor. He was a high seller in the 2006 P+ sale and has developed into an outstanding bull. This dynamic Emblazon son is ultra smooth and neat fronted and has plenty of extension. His incredible dam is an ideal brood cow with an exceptional udder and marvelous milk volume. She is a paternal sister to the P+ senior herd sire, Whopper. Baseline stacks the best basic bloodlines from the respected Rollin Rock, Ohlde and Benoit programs. 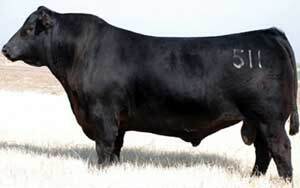 Note that his great granddam, "61", is the one of the most sought after cow families in the breed. Use Baseline for superior calving ease and ultimate females.